Continued... 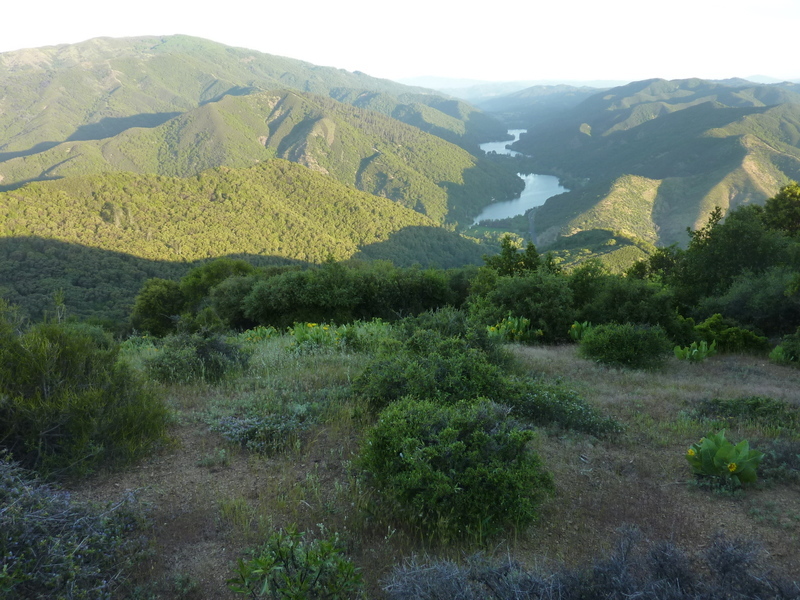 I had slept the night at a turnout off Scotts Valley Rd in Lake County, named for nearby Clear Lake, the largest freshwater body of water wholly within California. I had two hikes planned for the day, with hopes to get done early so that I could drive back south across the Bay Area before the afternoon rush hour set in. I was in the area for two days to tag a handful of P900s and P1Ks that I had neglected on previous visits. Located northwest of Clear Lake, this P1K lies on private property to the east of Scotts Valley. The route I followed from the southwest comes from a GPX track provided by Jeff Moffat on PB. While there are multiple routes to the summit and several are shorter, this one avoids going close to homes at the start. I was up early around 5:30a, quickly dressed and on my way to get going before the neighbors started their day. I reparked the van at the small, Glen Eden Park, a mean little bit of dry ground that looks sadly neglected. Just to the south is a ranch road leading east into White Rock Canyon where the Yerba Santa Goat Dairy is located. The road crosses Scotts Creek on an unusual, steel plate bridge before curving around the base of White Rock Mtn's Southwest Ridge. I left the road here, heading cross-country up the oak woodland slopes and onto the ridge. After the first ten minutes I was safely out of sight from detection below and was able to relax for the rest of the way to the summit. After crossing an old gate, I picked up the fire road that, combined with other old roads, could be followed in various flavors to the top. Though I saw none on the way up, I went by a small herd of grazing cattle on the return. Unlike most herds that take off upon my approach, this one closed in, with the younger members coming within 5-10ft of me before getting shooed away. It took a little over an hour to cover the 2.5mi and 1,400ft of gain to the summit where I was treated to open views on a cool, crisp morning. Clear Lake can be seen in the distance to the southeast, Blue Lakes to the northwest. White Rock Mtn is part of the larger Mayacmas Mountains that border the western edge of the county. I was back to the van by 7:30a, happy to have seen no one during the two hours I was on the outing. Red Rock is a CC-listed peak, not red, not rocky, and with little prominence, making its inclusion on this list somewhat of a mystery. But its close neighbor, Monument Peak, has 700ft of prominence and makes for an easy bonus. The track for this fine route came from David Sanger on PB, who was joined by Jeff Moffat and Andrew Kirmse in pioneering it. The two summits lie within a small patch of BLM lands, with the surrounding lands of uncertain ownership. The route starts from the northeast off Highland Springs Rd, making use of some old ranch roads with no fences to cross or No Trespassing signs to warn folks away. The only signs I saw near the start as I drove south from Highland Springs indicated that "Trespassing for the purpose of discharging firearms is prohibited." I'm good with that. It may also be possible to continue driving west on Highland Springs Rd and south on Adobe Creek Rd to get within 1.5mi of the summit. The roads appear to be well-graded but I don't know if there are gates encountered. Since I had the time and energy, I opted for the 5mi route used by the others. There is a turnout and a gate where the route starts, and the crux is immediately encountered in the crossing of Highland Creek. With the help of a questionable log, I managed to jump across the creek without getting my boots wet or having to take them off. I then followed the prescribed series of dirt roads that haven't seen any vehicle traffic in decades, at least until I neared Adobe Rd atop the crest after the first hour. Someone has erected a small shade structure in a sloping meadow on the east side of the crest, purpose unknown (hunting, maybe?). It was 9a when I reached Adobe Rd, well-graded as previously mentioned. A series of street signs, wholly incongruent, have been placed along the length of the road at various locations, presumeably for humorous effects. I spent the second hour hiking along Adobe Creek Rd and a lesser road going along the crest of the Mayacmas over Monument Peak and Red Rock. Differing in height by only 50ft, they have similar views overlooking the chaparral-covered hills that make up the range. Pines and other trees are found at the highest elevations and the north-facing slopes. Getting to the summit of Red Rock requires some minor bushwhacking off the road to reach the register that the others had left on their visit a few months earlier. It took me another hour and a half to reverse the route back to the start, not seeing another person until I had crossed the creek at the end. I met up with a couple who pulled in to the same turnout, answering questions posed to me about public access rights. I told them what little I knew about it, but offered that they were unlikely to find another soul back there and wished them well. After they'd crossed the creek and moved out of sight, I repositioned the van and took a shower on the side of the road before starting back for San Jose. Having finished up well before noon, traffic issues would be minimal and I managed to get back before 3p - nice.